The local lottery fever continues. 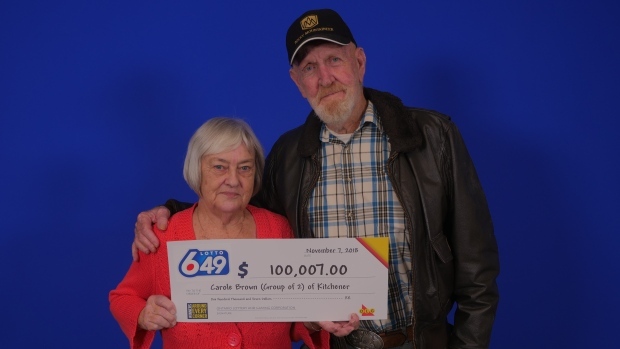 Carole Brown and James Cox of Kitchener are the latest big prize winners. They won their $100,000 prize on the Oct. 27 Lotto 6/49 Super Draw, as well as $7 on ENCORE selections, making their total winnings $100,007. Their winning ticket came from a Shoppers Drug Mart on Ottawa Street in Kitchener. In the last month, at least four people in Waterloo Region have been announced as winners of prizes between $100,000 and $1 million. The spate of winnings comes in the wake of the record-breaking Lotto Max draw on Oct. 19, though it only produced two of the winners. A Waterloo man and a Cambridge man both won a MaxMillion prize of $1 million. A Cambridge woman and a Kitchener woman also won big on prizes from lottery games.